While having a water well is ideal for a property located in more remote areas, that’s not the only situation they’re good for. Some people get water wells just to have the assurance of knowing what it is they’re drinking. Others just want to cut costs and have a better water source of their own. Water well drilling has been around for years and today’s wells are now more accessible than ever. Whether it’s for residential or commercial use, building a water well can improve your situation with water, but well drilling requires a meticulous process. That’s why it is always recommended to have the professionals do it for you. If you want to know more about the process, here are some common questions people ask about the water well drilling process. How long does it take to build a water well? The process will vary according to different factors, with the first being the quality of soil and the depth that is needed to hit the water source. Generally, it’ll take a few days or so. However, the process doesn’t end there. The water from that newly drilled well will be tested in a laboratory. This is done to find out what else is in the water. There can be bacteria, nitrates, fertilizers or even feces floating around in it. This may take a while but it is necessary for your health and safety. How many times do you need to test the water? Let’s say the well installation and initial testing is done. Does that mean the water is already safe to drink forever? You still need to make sure the water will stay that way. The water well drillers should tell you about yearly maintenance checks and testing. But it’s not just up to them to check the condition of your water. A well owner should also report any kind of sudden change in taste, odor or color. Since people are going to use this for drinking, cooking, and bathing, it shouldn’t have any contaminants that may cause illness. Does the water from the well need to be filtered? Some water sources are fit for drinking right off the bat, but it’s always better to be safe than sorry. There are some instances where the groundwater may have increased levels of iron. This is related to what people in the industry call water hardness. And the best way to address that is by using a filter. Water that is “hard” can cause a chalky, white build-up in places like the dishwasher and shower-heads. This is where a filter comes in. It is usually included in a water well system and its job is to keep those unwanted minerals and particles from causing any trouble. If you’re interested in getting your own water well in Lapeer County, get in touch with Ries Well Drilling. 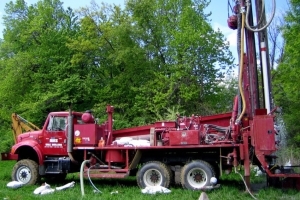 With state-of-the-art equipment and an experienced team of water well drillers for Lapeer County, Michigan, we’re ready to get the job done for you. Give us a call today to book an appointment.